What’s your vision? What’s your company’s vision? Are they aligned? According to Jim Collins and Jerry Porras in a Harvard Business Review article entitled, “Building Your Company’s Vision,” companies that enjoy enduring success have core values and a core purpose that remain fixed while their business strategies and tactics endlessly adapt to the ever-changing world. Truly great companies understand the difference between what should never change and what should be open to change — between what is sacred and what is not. 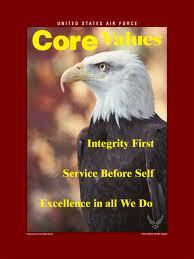 Core values are the essential and enduring tenets of an organization and an individual. Walt Disney’s core values are imagination and wholesomeness. P&G’s core value is product excellence. Nordstrom’s is service to the customer. Hewlett-Packard is respect for the individual. Amazingly all of these spectacularly performing companies narrowed down to one or two core values. According to Collins and Porras, companies tend to have between three and five. Most have three or four. If you have six or more, you may be confusing core values that do not change with operating practices, business strategies or cultural norms which should be open to change. 1. What core values do you personally bring to your work? 2. What would you tell your children are the core values you hold at work and that you hope they will hold when they become working adults? 3. If you awoke tomorrow with enough money to retire for the rest of your life, would you continue to live your core values? 4. Can you envision your core values being as valid for you 100 years from now as they are today? 5. Would you want to hold your core values, even if at some point they become a competitive disadvantage? 6. If you were to start a new organization tomorrow in a different line of work, what core values would you build into the new organization regardless of the industry? An integrated marketing professional who generates insights from analytics to increase revenue. My blog for marketing now resides at www.insightsfromanalytics.com/blog. After getting requests from a number of people about my eating and exercise routine, I've decided to begin sharing about my healthy obsession with Chipotle and exercise. This entry was posted in Consumer Insights and tagged Consumer Insights, core values, Hewlett-Packard, Nordstrom, P&G, vision, Walt Disney. Bookmark the permalink.